After reading a few comments from people who tried to make Southern Living’s Peanut Butter Streusel brownies but had problems with the bake time, I decided to test the peanut butter streusel on Gloria’s banana brownies. It worked perfectly and the peanut butter partnered well with the banana. For kicks, I left peanut butter streusel off one quadrant of the brownies and tried swirling peanut butter on top (top left). To keep the peanut butter from drying out, I mixed it with a little melted butter, softened it, then drizzled it on. 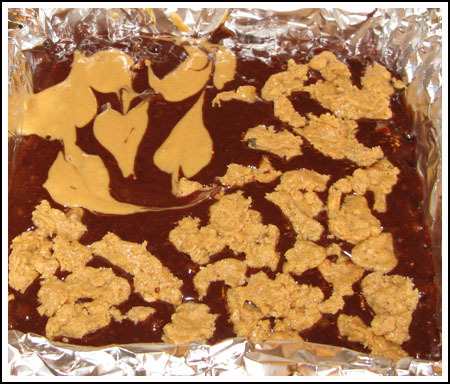 Unfortunately, the peanut butter still dried a bit and I ended up having to rub more plain peanut butter over the hot brownies just to make them look good, but the end result was still great. Next time, I might try mixing the peanut butter with a little vegetable oil instead or might even just rub the peanut butter mixture after baking like in this recipe. Another thing that might work with Gloria’s brownies is the peanut butter ribbon technique. Melted peanut butter chips add sweetness and help the ribbons hold their shape while baking. I haven’t made peanut butter ribbons in a while because I’ve been out of peanut butter chips, but I think they’d work well here. UPDATE: This recipe has been updated and improved! Here’s the recipe. Well, I tried the modified version after a night of cooling. Not bad and I like the 2T cocoa, 1 oz unsweetened, 5 oz semi sweet chocolate combo with the whole banana. I didn’t miss the chocolate chips. I will cut down on the extra flour I added as they were just a tad dry (maybe from over baking though…) It’s too bad you are the only banana=eater in your house! My proof reader is on vacation….baseballt?? And I definitely don’t have lemons in my whipping cream!!! Hi Anna! I’m just coming down off of a MN Twins loss to the Yankees, but they put up a good fight into the 11th inning. It was an exiting baseball game if you like baseballt! Yes, the pb I used has no sugar and is the refrigerated kind. It is almost liquidy at room temp so I probably didn’t need to add the extra butter. I didn’t use the streusel, just the plain pb marbled around on top. I like it too much not to try it again with different pb or no butter added next time. Switching to lemon….I’ve got my lemons whipping cream all ready for the lemon loaf this weekend. It is supposed to snow here tonight so it is a perfect baking weekend…but snow????? Yuck…..! Thanks for logging the changes. I’ll have to try your variation. I’m not sure whey the streusel got holey. The only time that happens to me is when I use to much fat in proportion to the other ingredients. Did you use a peanut butter with less sugar? Maybe one with a higher percentage of fat than sugar? It looks really delicious and has to be with so many great ingredients packed into one dessert. Has anyone tried cutting mini reeses cups in half and poking them into the batter before baking? Are they good or too rich? I’m always looking for the easy way…. Wow my boyfriend would die for these! Thanks Anna! Appreciate that… Hee! a 100g or so banana is usually considered a “large” here, so I’m glad I asked, or I would have ended up using just a teeny weeny bit of banana in the brownies… and maybe the texture would have come out different?? Thanks again. LOUISE–why not swirl with Streusel too. I think thats where im going with this! Go for the home run I say!!! Gloria, I emailed you a recipe. But yes, you would need an egg. Alyssa, I’ve been using bananas that are about 3 1/2 to 4 oz/100-114 grams, so if you want to weigh the banana, go with 50 to 55 grams. I don’t think you have to be too precise with the banana, but I’ll go ahead and add that to the recipe above. I will count the days until Katrina tries these ahahah! Those are just great! Maybe you can even do the peanut butter swril and streusel together for serious pb love! 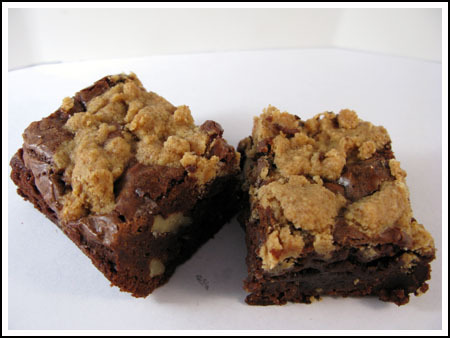 The PB streusel brownies look so good – i just love the PB choc combo… and to add banana to the mix… wow! Anna, just wondering how big/small is a “small banana” in the US? Would you have an estimate weight of the amount of banana you used in this recipe? Thanks so much! Scrumptious looking but ithis chocolate book author is finally chocolated out–just for a day or two. The other day, I did receive about 16 macaroons–10 dipped in dark chocolate…Yes, to die for but moderation is a challenge, huh? Fruit and veggies on a chocolatey day. I’ve got pie on the brain–for the poster who wants to bake something. Uh oh, chocolate pie comes to mind. Veggie girl…make an rhubarb-apple pie! Gloria, I think you’d need an egg. I’d find a recipe for cheesecake brownies and try it with strawberry cream cheese. Did you check the Kraft site? I love reeses peanut butter cups so I’ll love these! 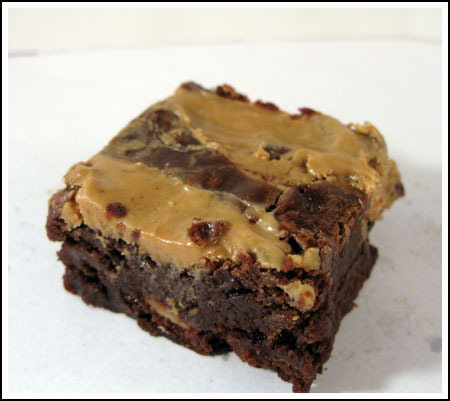 On another note, does anyone know how I would incorporate strawberry cream cheese into these banana brownies? I just want to buy the already made up flavored cream cheese.. Do I need to add an egg to the cream cheese? I am unable to find a pink/strawberry-swirled chocolate brownie on the web….maybe one of you adventurous bakers could try it and let us know if it is good!!!! Ya killin’ me here! Sigh. Added to the top of “the list”. Love pb/choc/banana combo, but you already knew that didn’t you! I really need to try that streusel!